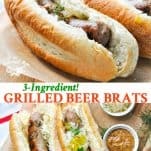 Home » What We're Eating » 3-Ingredient Grilled Beer Brats + a Video! 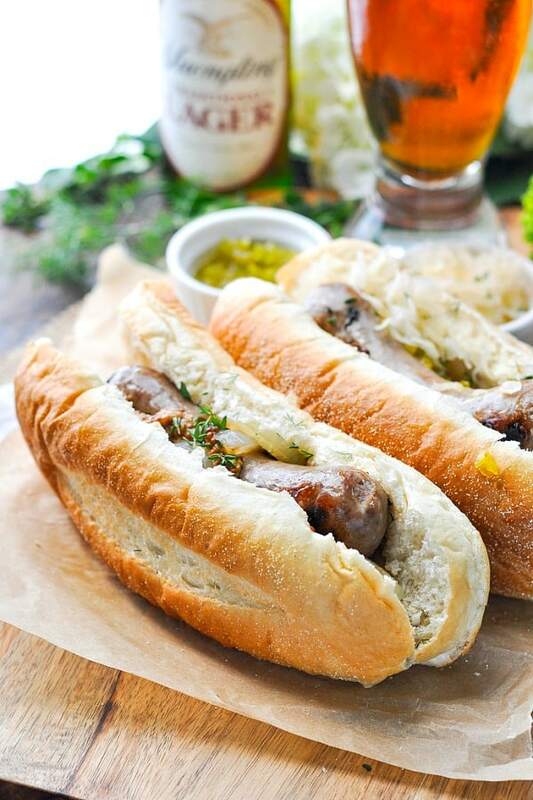 With just 5 minutes of prep, these 3-Ingredient Grilled Beer Brats are a simple and delicious addition to your next summer cookout! 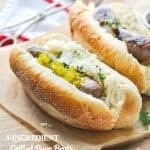 With just 5 minutes of prep, these 3-Ingredient Grilled Beer Brats are a simple and delicious addition to your next summer cookout or tailgate! 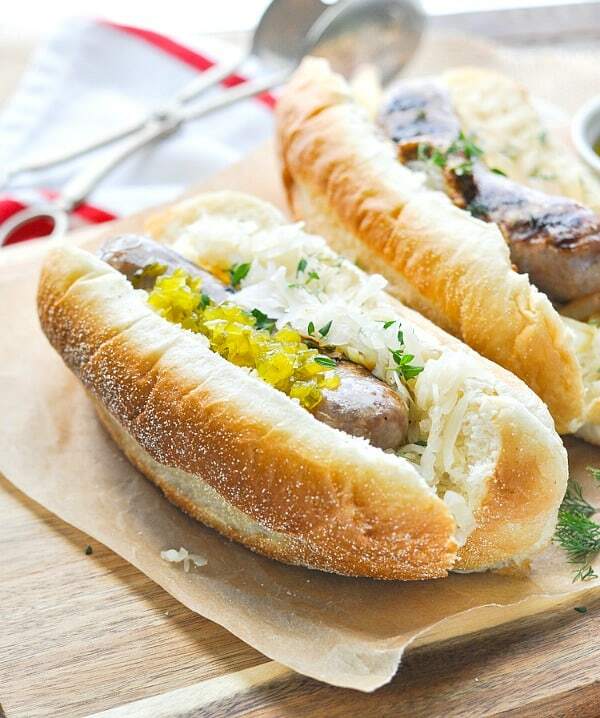 Add hoagie rolls, sauerkraut, and your favorite mustard or relish for a fun twist on the classic family dinner! Hey, friends! If you’re like us, then you’ve probably had more than your fair share of grilled hamburgers and hotdogs this summer! 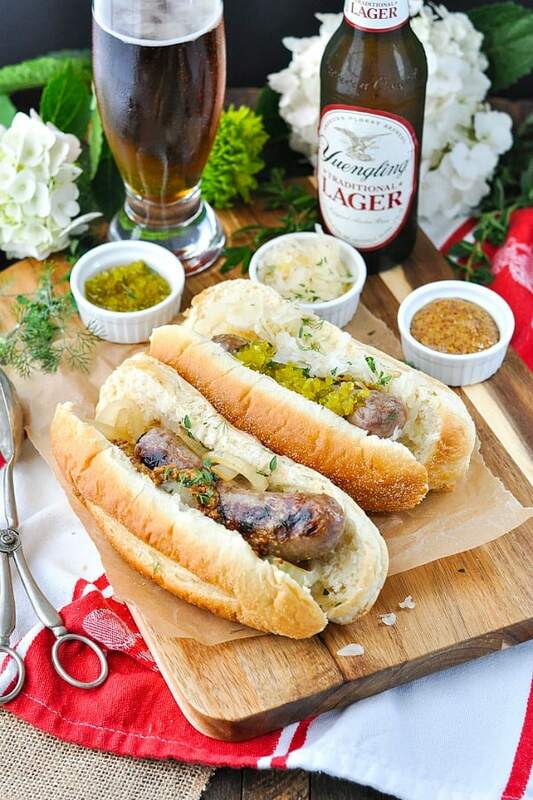 That’s why I decided to throw in a twist today and celebrate a fresh spin on another summer grilling classic: beer brats! 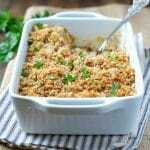 Just place the sliced onion and the brats in a large pot or Dutch oven. 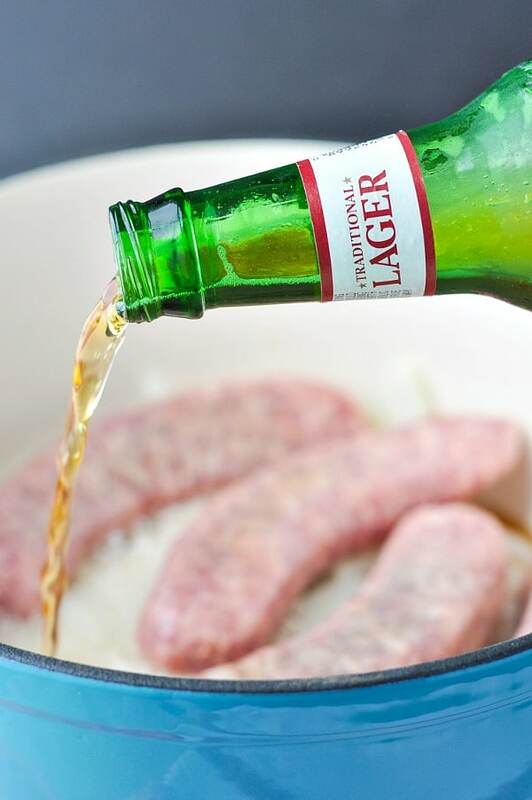 Pour Yuengling Lager over top to cover, bring to a boil, and then simmer the brats for about 15 minutes. When the brats are cooked through, you can finish them on the grill (or on an indoor grill pan) for a few more minutes until they’re charred and golden brown. With crispy rolls and an array of your favorite toppings, the summer feast is ready! 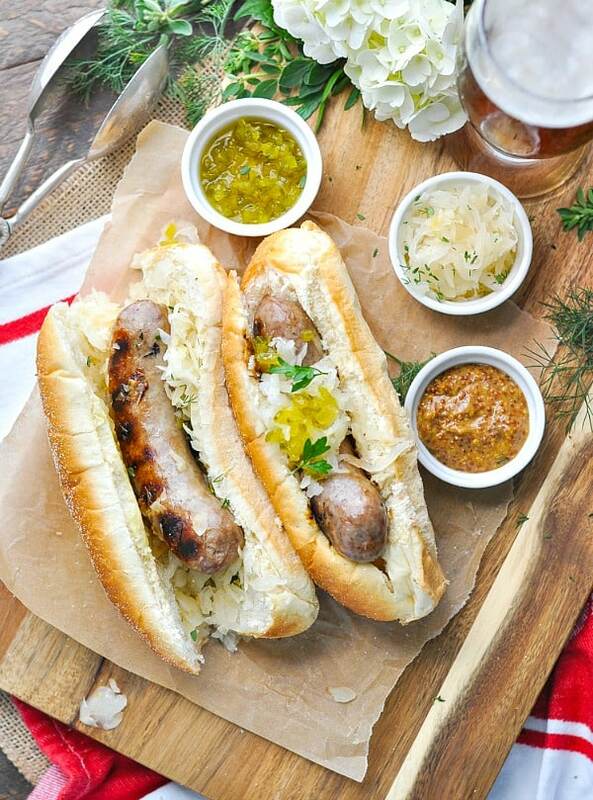 We love to top our brats with the sweet simmered onions from the original pot, as well as some Dijon mustard, pickle relish, and sauerkraut. There’s so much rich texture and flavor in every bite! Cooking for Just Two? You can follow the same instructions, but only prepare two of the bratwurst in the package. 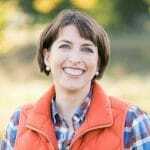 Wrap the remaining uncooked brats in plastic wrap and freeze for up to 3 months. 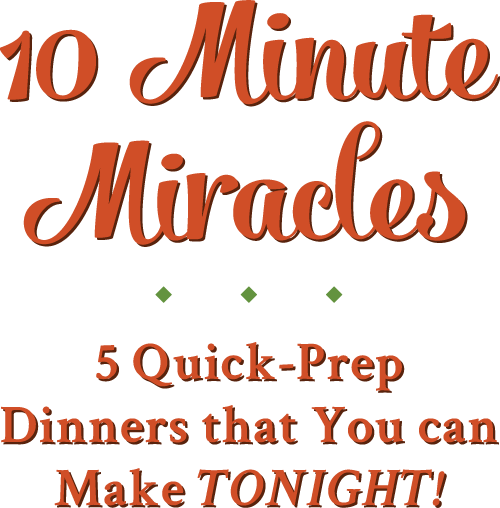 Want to Prep Ahead? You can simmer the bratwurst in the onion and beer, as instructed, and keep it in the pot until ready to grill. 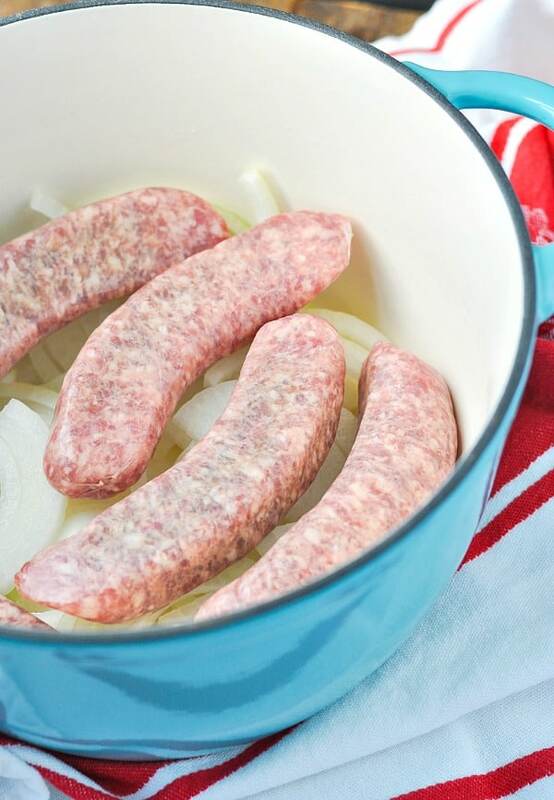 Place brats and onions in a large, deep pan or Dutch oven. Pour beer over top until brats are completely submerged. Bring to a boil. Reduce heat to low and simmer until the brats are cooked through (about 15-20 minutes). Remove brats and place on a tray. Grill brats over medium-high heat until golden brown (about 3-5 minutes per side). Serve immediately, or return to beer mixture until ready to serve. 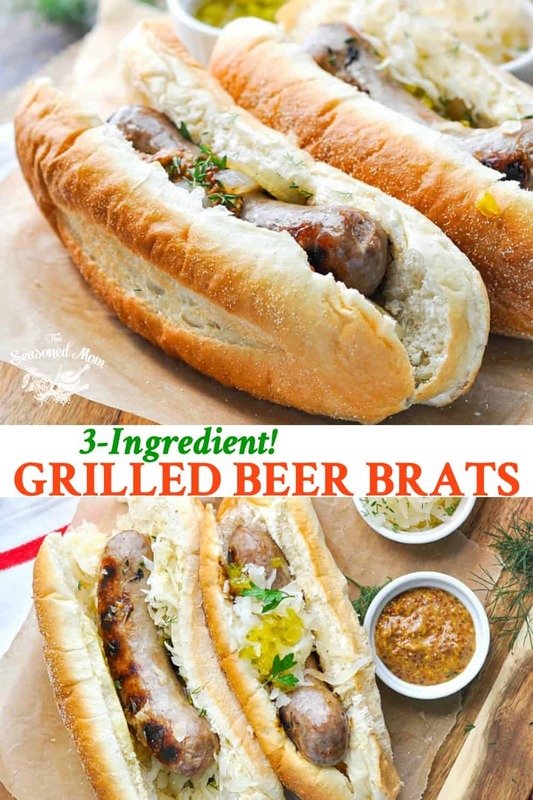 Beer brats are my favorite! My family used to make them this way growing up, so I know how delicious they are. 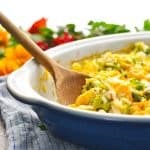 I’ve got to try this for my husband and I…such a perfect summer meal! Yes — you’ve definitely got to try these while your grill is still out this season! 🙂 Thanks, Gayle! FEED ME ALL THE BRATS. These look SO good and just scream summertime! What an interesting idea! 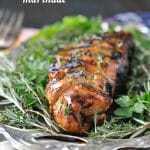 Jesse has a “brew and ‘cue” day every month or so with his friends where they brew beer and barbecue and this would be the perfect recipe for them to make! Oh, this would be perfect for Jesse and the guys! Wow! This looks really good. Made me crave for beer and really good food. Loved the video. 🙂 Can’t wait to try this. 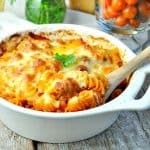 These are the ultimate comfort food, love it!